Eric lived at Stanlea, Sunnyside in Todmorden. He died aged 21 years when his plane, Whitley LA841, crashed into the sea 1.5 miles off Nairn in Scotland. He was with No. 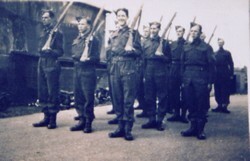 19 Operational Training Unit for Bomber Command. 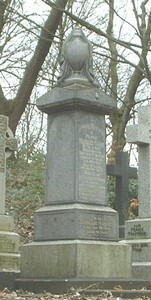 He was buried in a Commonwealth War Grave at Christ Church in Todmorden. He is particularly remembered on this page because in the 1990's when an extension to the school was built, his grave and headstone were covered over along with other graves, and no longer visible. On 19 November 1917 Thomas enlisted with the 7th Sherwood Foresters. He was 18 and worked as a warehouseman in Walsden. He was transferred to the Leicestershire Regiment a year later. He served in France where he was shell shocked and sent back to the 2nd Northern General Hospital, Leeds, where he transferred to the Royal Army Medical Corps. Thomas was under psychiatric care at the hospital and was damaged a great deal mentally. He worked as a clerk at the hospital until his discharge in January 1920. His testimonial from the RAMC states: "Has given satisfaction and is a steady and conscientious worker". He was assessed as 30% disabled, attributable to his war service, and awarded a pension of 12 shillings a week. Thomas returned to live with his mother at Hollins Place in Walsden but never recovered from his experiences. He never married, remaining with his mother until she died. His niece remembers him as a gentle, caring man, very intelligent and artistic, whose life was shattered by the war. He died in Scaitcliffe Hall Nursing Home on 13th October 1975. The son of Charles and Mary Hannah Foulds and husband of Susan Haigh Fielden. Young was a wholesale baker alongside his father, with a successful business at 2, Stones Terrace in Walsden. On 4th December 1915 he enlisted with the Grenadier Guards and served throughout the rest of the war. He was discharged on 27th November 1918 suffering from a skin complaint he attributed to iodine poisoning after having the iodine applied to an open wound. The problem continued throughout the rest of his working life as the flour caused irritation and he often had to cover his hands. The son of Michael Higgins and Elizabeth (Rowe) of Todmorden. George served in the Worcester Regiment, signing up under age when he was 17. He was awarded the British and Victory medals. His sister Ethel remembered he was very keen to go, and once there he was very keen to get out. He fought in Ypres and his memories were of being 'slutched up' and putting lit matches under his clothes to try to kill the lice. He was taken prisoner by the Germans until the end of the war. George's brother Christopher Higgins also served in WW1, whilst his younger brothers Edward and Albert Higgins served in WW2. Edward was in the Medical Corps. Albert was on the Prince of Wales when it sank after being bombed by the Japanese on December 10, 1941. 327 were killed from that ship and 513 from the Repulse which was bombed at the same time in the worst British naval defeat of World War II. He never spoke of it except once to his brother George on an anniversary - "This was this day I was blown to hell." His wife did not know for months whether he had survivied or not. Finally when she got a telegram, she could not bear to read it and had to ask a neighbour to do so. There are other photos of the Higgins family in the PHOTO GALLERY . 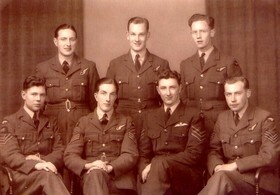 No 467 Squadron RAAF Bottesford. Jack was the elder son of John & Alice Greenwood of Carrs Rd. Portsmouth, Todmorden. He joined the RAF in 1940 and was promoted to sergeant in January 1943, the same month he married Mildred Hartley. He died when his plane went down a mile short of home after a raid on Turin, 13th July 1943. The plane was not damaged by enemy action. The crash was due to inferior riveting in the tail section. This section dropped off immediately the undercarriage was lowered. His charred body was discovered sitting upright on the rest bed, which was still intact. He was 25. 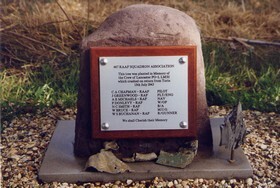 The memorial was erected by Jack's family and the 467 RAAF Squadron Association in 1999 in memory of the crew of the LM311. It is on the edge of the field in Bottesford where the crash occurred. The metallic bits are pieces from the plane, which still turn up in the field from time to time. Even all these years later, nothing will grow on the crash site itself. Jack's widow Mildred's war time story can be read HERE. The younger brother of Jack Greenwood (see above) and son of John & Alice Greenwood of Portsmouth, Todmorden. Leslie was a Signaller (wireless operator), combined operations (Army/Navy/RAF) and landed on D-Day. According to another brother, Peter Greenwood, the wireless was moved around in a wheelbarrow. Leslie emigrated to New Zealand in 1952 and died at Christ Church in 1993. He was killed during the Third Battle of Ypres on 7th June 1917. His final resting place is unknown. 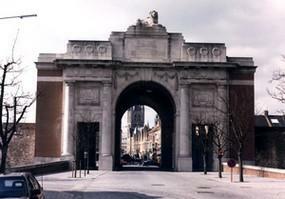 He is remembered with honour on the Menin Gate Memorial at Ypres, which bears the names of more than 54,000 officers and men whose graves are not known. He was awarded the D.C.M. for gallant conduct on 4th June 1915 south of Krithia, (Dardanelles) Gallipoli, for volunteering to attack a redoubt, and holding it with 4 other men until relieved ten hours later. He had previously been mentioned for gallantry. Private Child died from his wounds on 4th August 1915, shortly after having earned his distinction. 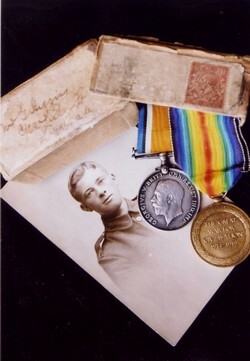 His medal was presented to his father in the Town Hall, Todmorden, on 30th November 1915. He lived at Stoodley. He achieved the remarkable record of winning 3 separate distinctions, namely: the Military Cross, the Distinguished Flying Cross and the Italian Medal for Valour. When on patrol work on 4 separate occasions he shot down 5 enemy planes, 3 of which were observed to burst in to flames, one being a 3-seater. On two of these occasions his formation was attacked by superior formations of the enemy. His magnificent work has been marked by great dash and fearlessness. James Mitchell was promoted to Lieutenant and went overseas on 7th. October 1917. He made his first flight across the Channel, and was on the Ypres-Dixmude Front about 6 weeks, during which time he brought down 3 Hun machines. On one occasion he and his captain were hotly attacked. The captain fought off the machine that was attacking Lieutenant Mitchell, and the latter fought the machine which was attacking the captain., and they succeeded in bringing down both machines in flames. Because of this he was promoted to the rank of Captain. In November he was transfered to the Italian front, serving up in the Alps, in the North of Italy and on the River Piave. Here he brought down 3 more enemy machines, including a Gotha, one of the big fighting planes carrying 5 machine guns, 25cwt. of bombs, 2 gunners and a pilot. Practically all his fighting in Italy was done at an altitude of 12,000 feet. He was presented with his medals in Todmorden on 11th. July 1918. He was awarded the Military Cross because when all his senior officers had become casualties he took charge of the Company, and led it forward against heavy fire, capturing a German strong point, three machine guns, and 25 prisoners. Subsequently he was awarded a bar to the Military Cross, his record on this occasion being that he handled his platoon with great skill in attack, and led them forward under covering fire from Lewis gun and rifle grenades, and assaulted a strong point, which he captured with 30 prisoners. His courage and determination were a splendid example to his platoon. In August 1919 the President of France conferred on him the further distinction of the French Croix de Guerre avec palme. Bombardier Herbert Barker, D.C.M., M.M. He received the Distinguished Conduct medal and the Military Medal for conspicuous gallantry and devotion. He had on several occasions shown great courage in repairing the lines under heavy fire, thereby rendering most valuable service in maintaining communications at a critical period. He was presented with his medals in Todmorden on 11th. July 1918. 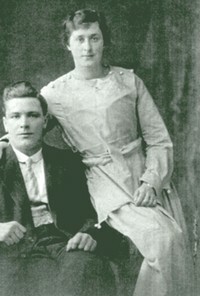 Herbert married Alice Greenwood of Beanhole Head in 1919. In the 1940's and 50's they lived at 2, Cornfield Street, Millwood and are fondly remembered by Derrick Flynn, a great nephew of Alice, who kindly submitted the photo of Herbert and Alice. He was awarded the Military Medal but lost his life on 3rd October 1918, shortly after the distinction and before he could return home to Todmorden to receive his award. He is buried in Belgium. He was the son of Bradshaw Allister of 10 Queen Street, Todmorden. He was awarded the D.C.M. for good leading of his platoon on 4th June 1915 south of Krithia, (Dardanelles) Gallipoli under heavy rifle and shrapnel fire, to take a Turkish trench. He cleared one flank himself, killing eight Turks. He survived the war and was presented with his medal at Todmorden Town Hall on 30th November 1915. Corporal John H. Garside, M.M. "We had tremendous welcomes everywhere, particularly when we got to Italy. Every time we stopped we found crowds on the platforms waiting for us, and they gave us sandwiches, hot coffee, biscuits, flowers and cigarettes; also we got big bunches of grapes and carnations. At Milan the people went pretty well mad. We had 3 or 4 hours there, and were split into parties of about 50 and marched through the city. The streets were simply packed and wherever we went we were pelted with flowers." John later died as a prisoner of war in the hands of the Germans. He was awarded the Military Medal. The Todmorden Gazette described him as " a bold and determined fighter in the air and against troops on the ground. On 26th. August 1918 he engaged 3 enemy 2-seaters and shot one down out of control. Owing to his pressure pump being shot away in the combat he reached our lines with great difficulty, landing 150 yards west of our front line. Undisturbed by the fact that the machine was under direct observation and subject to heavy fire, he removed all his instruments and pegged the machine down before leaving. In all, up to this time, he has accounted for 5 enemy machines." Later, he was awarded the bar to the D.F.C. and the Croix de Guerre "for numerous successes against the Hun machines, and also for good squadron work." Will was the son of William and Emily of the Rope & Anchor Inn on Halifax Road. His life was full of drama from birth to death, and his story can be read in full HERE. Sergeant Taylor was killed in action in France 13th June 1917, aged 20 years. He was born, one of twins, in 1896, the son of Joshua and Mary Taylor. Mary did not survive the birth. Arthur's twin sister was Lily, and his older brothers and sisters were Robert, Betsy Hannah, Matilda, Robert and Annie. Annie lived to celebrate her 100th birthday some 75 years after Arthur died. When the news of Arthur's death arrived the family was devastated. My mother, who was five years old at the time, could remember the day clearly. His older brother Robert locked himself in an outbuilding on his farm at Clinton and wouldn't come out for two days. His mother's unmarried sister, Fanny, who had helped to bring him up, was never the same again and it was said she died of a broken heart. Sergeant Taylor has no known grave. He is remembered at Loos Memorial, Pas de Calais, France, which commemorates over 20,000 men who have no known grave. 172 of these memorials are for men from the Lancashire Fusiliers. Also Sergeant Arthur Taylor Lancashire Fusiliers the beloved son of Joshua and Mary Taylor who was killed in France 13th June 1917 in his 21st year. Herbert was the 21 year old son of Willie and Betsey Alice Coupe of Todmorden. He died of wounds sustained in France and is buried in a vault in the Unitarian Church graveyard. 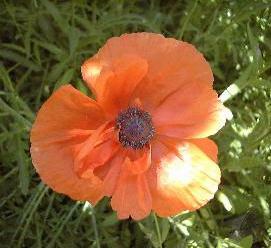 In loving memory of Private Herbert Coupe of the 1/6 Battalion Lancashire Fusiliers who died of wounds received in France February 18th 1918 aged 21 years the beloved son of Willie and Betsey Alice Coupe of John St. Private Boyd was the youngest of 3 brothers serving his country in the Great War. He was wounded at Gallipoli at the age of 18, spending 3 months in hospital in Cairo. He survived the war, and died of TB in 1924. The brothers were the sons of George and Eliza Boyd. about Henry and his two brothers, who were not so lucky. The family of Mrs. Boyd a widow, of 123 Longfield Road, Todmorden, possesses a fine record of patriotic service. Mrs Boyd has just received news that her son, Corpl. George Boyd, of the 1st Rifle Brigade, has been accidentally killed during rifle inspection in Flanders, and that another son, Pte. 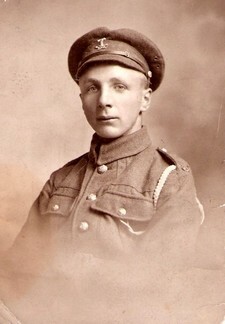 Henry Boyd, aged 18, has been wounded whilst serving with the 6th Lancashire Fusiliers at the Dardanelles. A third son, Rifleman Frederick Boyd, of the 3rd Rifle Brigade, has been missing since Sept 25. Mrs Boyd has only one son at home now, and he is too young to join. A fourth son, Jesse Boyd, died from a malady contracted during the South African War, and her late husband served for many years in the Royal Navy. Corporal Boyd was killed accidentally on Thursday, 10th June 1915, aged 28. 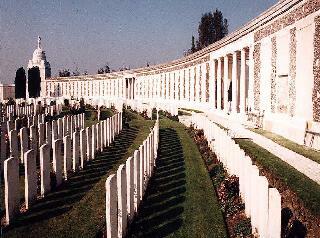 He is buried in Duhallow Advanced Dressing Station Cemetery in Belgium. It was during a rifle inspection that one of the platoon accidentally set off his rifle, killing Corporal Boyd. Frederick originally enlisted in the Worcestershire Regiment before the outbreak of war. Rifleman Boyd was reported missing from 23rd September 1914 and subsequently presumed dead. He has no known grave and is remembered with honour on the La Ferte-sous-Jouarre Memorial at Seine-et-Marne, France. The family of Mrs Boyd, 123, Longfield-rd Todmorden, have rendered remarkable service to their King and country, and the third of her gallant sons has now sacrificed his life - Rifleman Fred Boyd, of the 3rd Rifle Brigade. 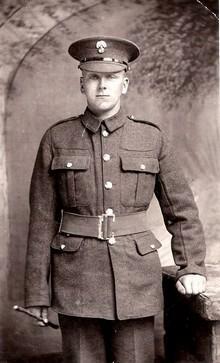 Rifleman Boyd had been missing since the battle of the Aisne, and the Army Council have now concluded that he is dead. Mrs. Boyd's late husband was for a long period in the Royal Navy; her eldest son (Jesse) died from the effects of a malady contracted in the Boer War; Corporal George Boyd, of the 1st Rifle Brigade, lost his life with our forces in France; and Private Henry Boyd (18) was in hospital at Cairo three months for injuries received with the First 6th Lancashire Fusiliers in the Dardanelles. Private Johnson was killed in action at Anzac Ridge, Ypres, on 19th November 1917 aged 31 years. He left a widow, Emily. He has no known grave and is remembered with honour at the Tyne Cot Memorial in Belgium, which bears the names of almost 35,000 officers and men whose graves are not known. Details supplied by his great grand nephew, Jack Davies of Walsden. We regret to record that official news was received yesterday morning that Private W. I. Johnson (Duke of Wellington's) had been killed in action. Private Johnson who resided at 9 Crossley St., Longfield Rd. was 30 years of age and leaves a young widow, for whom much sympathy is felt. He was formerly employed at the slipper works of Barker Clegg Ltd., and joined up about fifteen months ago, crossing to France last Christmas. He was connected with Roomfield Baptist Church and School. Lieut. Hirst writes to Mrs Johnson, "I regret to inform you that your husband was killed on November 19th by shellfire. I am sure his loss will be a great blow to you. We shall miss him very much, as he was of a most cheerful disposition and was the life of his platoon. You will no doubt be a little satisfied in your mind to know that everything possible was done for him at the time, and he was buried by his comrades, and his grave is now marked by a neat white wooden cross. I trust God will give you strength to bear your sorrow, and hope that you will accept the deepest sympathy of the officers and men in the company." born in Walsden and died aged 33 on 3rd May 1917 in France. David Watt was a porter at Todmorden railway station when he joined up on August 4th 1914. He was wounded at Mons that same month and was back in Todmorden in the first week of September 1914. He returned to his unit and was back in Todmorden wounded for a second time in December 1914. He was wounded a third time at Christmas 1916 and was later gassed in August 1918. He never entirely recovered from the effects of this. He was demobilised in the December of 1918 and arrived home in January 1919. He had only been back in his job two weeks when he developed influenza and pneumonia, from which he died. His name is included on the Todmorden war memorial of those killed in action. 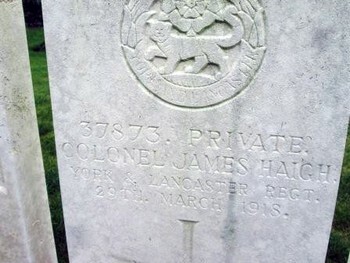 Private Haigh died of wounds sustained in action in France on 29th March 1918 and is buried at Gezaincourt Communal Cemetery Extension. 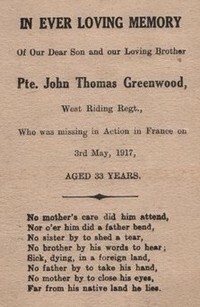 He was the 23 year old son of James and Mary Haigh of 115, Knowlwood Road, Walsden. He is remembered with pride at Cloughfoot Chapel burial ground. died of wounds March 29th 1918 aged 23. Also James Haigh of Knowlwood died May 20th 1922 aged 67. Also Gertrude Haigh died February 14th 1966 aged 75.
which Stephen Binks had kindly provided. He received his medal for gallantry while on sentry duty at an advanced post south of Krithia on June 4 th 1915, noticing movements in the scrub, and boldly going into it on his own initiative under heavy fire. He found a Turkish machine gun with an officer. He took the revolver from the officer and brought in the machine gun. He was presented with his medal at Todmorden Town Hall on 30th November 1915. Major the Rev. G.F. Walters, M.C. He was the minister of Inchfield Bottom Methodist Chapel and obtained leave of absence from his church early in September 1914. He was awarded the Military Cross for services rendered in France. During one of the big engagements on the Western Front, Major Walters was engaged for 4 days and 4 nights dressing wounds at one of the stations. He received the M.C. from His Majesty the King at Buckingham Palace. He received his Military medal for conspicuous bravery in extinguishing an ammunition dump which had been set alight by the enemy shell fire whilst the battery position was being heavily shelled. He was severley wounded whilst performing this brave deed. He received his Distinguished Conduct Medal for setting a fine example to all ranks of initiative, leadership, and fighting spirit during an attack east of Serre on 21st. March 1918. Walter lived at Monas Terrace, Walsden. He went down with his ship, The Cassandra, after she struck a mine in the Baltic on 4th. December 1918, shortly after the signing of the Armistice. The Cassandra was a light cruiser attached to the Grand Fleet operating from the naval base at Rosyth. 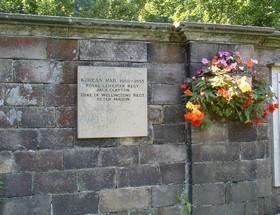 Rowland was born in Todmorden in 1897, the son of Fred Miltchell and Amelia Rowland of Back Brook Street, Langfield. He won the Military Medal for "exceptional gallantry in keeping going a Lewis gun when all the other five who went out with him had been knocked out. Two were killed, two wounded, and one taken prisoner. He was left alone and kept the gun in action. He was in Egypt in 1916 and France in 1917. He was presented with his medal in Todmorden on 11th. July 1918. John Thomas was the son of James and Mary Ellen Stephenson of Todmorden. He was killed on the Somme aged 23 years in November 1916 and is buried at the Regina Trench Cemetery, Grandcourt. he is also remembered on his family gravestone at the Unitarian Church in Todmorden. 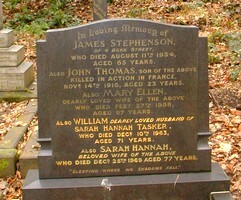 Son of James and Mary Ellen Stephenson, of 12, Goshen Terrace, Todmorden. Arthur was born in 1896, the son of Robert and Fanny Jackson of Walsden. He was killed in action on 25th April 1917 aged 21 years, and is remembered at the Arras Memorial, Pas de Calais, France. He was living with his widowed father at 5, Dampier Street, Walsden, when he joined up. He is also remembered on the inscription on his parents' gravestone at Lumbutts Chapel burial ground. Chapel St Walsden, who died Sept 25th 1889 aged 17years. Also of Private Arthur Jackson, son of the above. April 25th 1917 aged 21 years . Mabel Jackson of 34 Square Rd. Walsden died Sept. 14th 1933 aged 19years . Also Constance Jackson, died April 27th 1924 aged 3 years . Corporal Palfreyman died at the age of 21 during the Battle of Ypres. His body was never found. He is remembered at the Tyne Cot Memorial in Belgium, which bears the names of almost 35,000 officers and men whose graves are not known, and is one of 4 memorials to the missing in Flanders. Hubert is also remembered on his family gravestone at St. Paul's Cross Stone. The memory of the just is forever blessed. Sergeant John Howorth, D.C.M., M.M. Sergeant Tom Ashworth, D.C.M., M.M. Sergeant T. E. Barker, M.M. Lance Corp. Alfred Crabtree M.M. He was awarded the Military Medal. He was killed in action in France on 24th August 1918 aged 23 years. He was the son of Walter and Lucy Ann Crabtree, of 8, Oak Mount, Willow Bank, Todmorden. 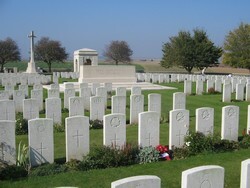 He is buried at Mory Abbey Military Cemetery in France. Lieut-Col. Austin Thorp C.M.G. D.S.O. Lieut-Col. Thorp was awarded the C.M.G., the D.S.O. and the Ordre de Leopold avec palme, and Croix de Guerre. He met his death in France on 30th. October 1918, a few days before the signing of the Armistice. A silver salver was presented to Dr. H. Thorp who represented the widow on 28th January 1920. He was the son of Charles William and Edith Thorp of Todmorden and husband of Edith May Thorp, of Elm Cottage, Camberley, Surrey. Lt. F.W. Crabtree, Yorkshire Regt. Will Greenwood, the dearly beloved son of Thomas and Emily Greenwood. 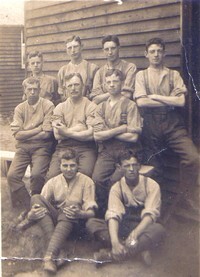 15th Royal Scots attached to the M.C.C. who died of wounds in France January 30th 1918 aged 25 years. A noble life. A noble death. He was killed in action on 5th. April 1918 in France. He was the son of William and Fanny Clay of 20, Beaumont Street, Todmorden, and husband of Lucy. Company Sergeant Major John Mason G.C.M. 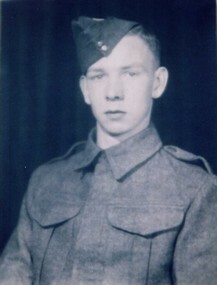 John also served in the South African War. He was awarded a Long Service and Good Conduct Medal. He was the son of the late William and Ann Mason of Manchester and husband of Bertha Mason of 767, Burnley Road, Cornholme. He was 47 years old. In August 1915, under very severe fire, the 1st Lancashire Fusiliers landed on 'W' Beach at the southern end of the Gallipoli Peninsula, Turkey, and cut their way through wire entanglements and trenches to the edge of the cliff. They established themselves in the surrounding hills. The beach became known as Lancashire Landing. On 7th August 1915, John and 14 other officers went over the parapet. 8 were killed, 6 were wounded and only one returned unhurt. John was one of the unlucky ones. He is buried at the Lancashire Landings Cemetery. Sam was killed on 30th November 1917 during the Battle of Cambrai, aged 33 years. He was the son of the late John and Mary Ann Barker and the husband of Sarah Helen Barker, of 7, Chapel St., Halifax Rd., Todmorden. Private Barker has no known grave. 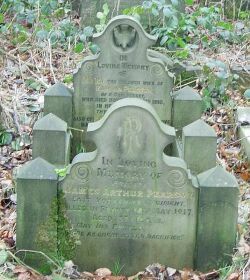 However, his wife remembered him with love and there is an inscription on the family gravestone at Heptonstall Church. Also of Sarah Ellen Barker wife of the above who died February 17th 1942 aged 74 years. Sam is also remembered with honour at the Cambrai Memorial, Louvervel. The Cambrai Memorial commemorates more than 7,000 servicemen of the United Kingdom and South Africa who died in the Battle of Cambrai in November and December 1917 and whose graves are not known. James was the son of Mary & Rawson Pearson of 8, Bar Street, Todmorden, and husband of Florence Pearson, of 5, Nutfield St. Todmorden. He is remembered with honour at the Arras Memorial in France and also on his parents' gravestone at the Unitarian Church in Todmorden. This building, erected in 1826, had been the home of John Fielden MP and his descendents since 1842 and was set within parkland. John Ashton Fielden inherited it and in 1910 he sold it to the Town of Todmorden. The grounds became the municipal park and remain so today. The house was commissioned for use as a military hospital on the outbreak of war and on 17th November 1914 the first batch of injured servicemen arrived. Many were severely injured and in a great deal of pain. Patients were drawn from many regiments and from different parts of the world, including 12 Australians, 3 Canadians, 1 New Zealander and 1 Russian. "The hospital was permanently closed on 28th February 1919, and its record is one of which Todmorden will always have reason to be proud, both on account of the service it rendered, and the vast amount of voluntary work which it called forth." In 2007, we had a communication from the Botley and Curdridge Local History Society, Hampshire, telling us about one of their holdings. This is a small autograph book with an address in the front cover of Miss Lottie Eastwood, 50 Sackville Street, Roomfield Lane, Todmorden and dated 27.1.1915. It appears that Lottie was working in some capacity with the injured soldiers being cared for at the Centre Vale Military Hospital in Todmorden and elsewhere. The Society kindly gave us the autograph book, extracts of which are below. Can you read the lion's mane? 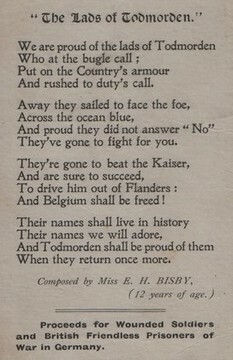 A poem to Kaiser Bill by R.W. "My chums were in a storm of hail and iron hail at that, and every man had to lie upon his stomach flat, for if he moved hand or head or made the slightest sign he would sure to lose his number in that thin khaki." After the First War, the Rose Garden at Centre Vale Park was chosen as the ideal place to convert to a Garden of Remembrance. Work began in 1921. Mr. Gilbert Bayes was engaged to design the sculptures, Mr. J. M. Firth of Todmorden was the contractor for the stone masons and Messrs. John Daymond & Sons for the tablets and engraving. Mr. Fred Law, the head gardener, was responsible for the nurseryman's work. The general scheme was designed by Norman Thorpe, architect, and the work was carried out under his supervision. The names of all those who died in the two World Wars are engraved on stone tablets arranged in bays along a portland stone wall. In the centre is a fountain statue about 12 feet high, also of portland stone, set in a basin of water. The figure is of St. George, leaning on his sword, standing on the dragon which spouts water into the basin. 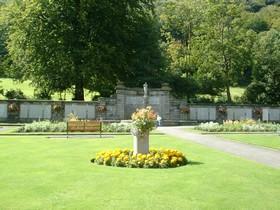 To the front and sides of the memorial are formal gardens, beautifully laid out, and very colourful. The whole garden is contained within a high hedge and is secluded and peaceful. A fascinating memorial is located next to the stone tablets. 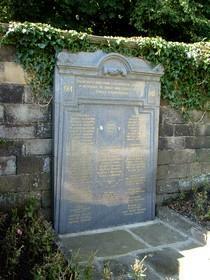 It was errected to remember the men employed by Todmorden Co-operative Society who fought in the First War. 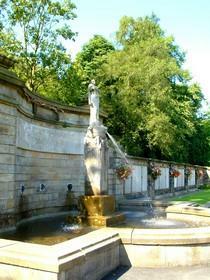 The names are inscribed on tablets arranged in six bays round a water fountain and the garden, which is beautifully planted. The names are arranged alphabetically, without distinction as to rank, under their respective regiments. There are 659 names representing 72 regiments. These are they who being peaceable citizens of Todmorden at the call of King and Country and in defence of their native land left all that was dear to them, endured hardship, faced danger and finally passed out of the sight of man by the path of duty and self-sacrifice, giving up their own lives that others might live in freedom. 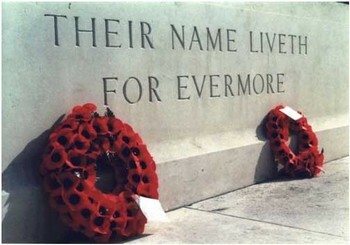 "Their name liveth on for evermore."